You won’t want to miss back-to-school happenings at OTC, and we have some pretty fun events scheduled for the first week of classes. Check ’em out below, and stop on your way to or from class! Did you know that @OzarksTech is on Instagram? Follow us and share your back-to-school selfies with the hashtag #myOTC. You could win prizes the first week of classes! 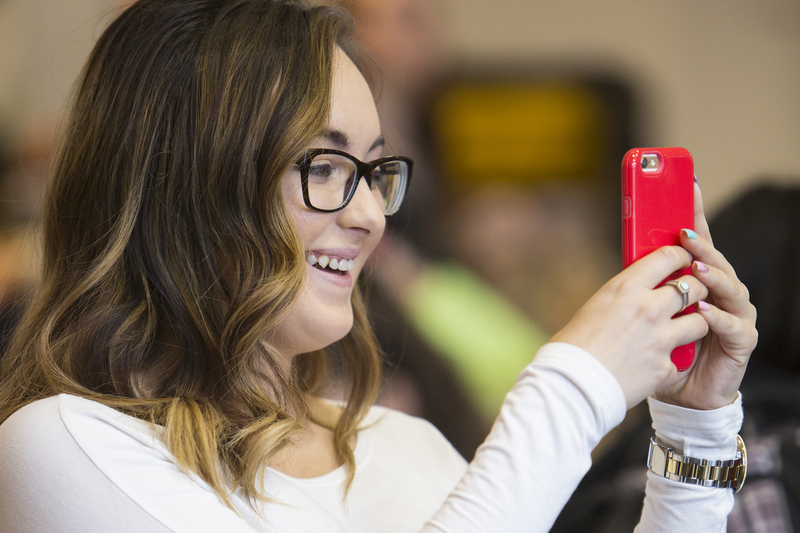 We’ll have a booth with selfie sticks and other fun props on the OTC Springfield Campus plaza Tuesday through Thursday. Stop by for inspiration and start snapping selfies! Tuesday, Aug. 18 from 11:30 a.m. to 1:30 p.m.
Join Christian Campus House on the OTC Springfield Campus plaza for fellowship, contests and giveaways. They’re bringing fun games like washers and corn hole, and they’re also organizing relay races. Christian Campus House was founded in 1977 to provide fellowship, teaching, worship and opportunities for service to college students at Missouri State University, OTC and Drury. Wednesday, Aug. 19 from noon to 2 p.m.
Join us for free pizza courtesy of Little Caesars on the OTC Springfield Campus plaza…enough said. Thanks, Little Caesars! Help us commemorate OTC’s 25th anniversary by participating in a giant group art project, which will be displayed above the Help Desk in the Information Commons building. 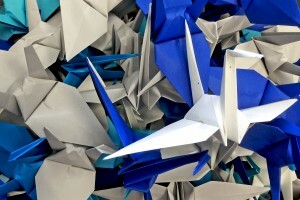 It’s our goal to construct a giant chandelier made of 1,000 origami cranes, which signify good luck. Stop by the Jared Family Atrium to fold a few cranes between classes. We’ll be there to help you get started and answer any questions you may have along the way. Join OTC’s Safe Zone allies on the OTC Springfield Campus plaza for minute-to-win it games, sticker handouts and freeze pops! Stop by on Wednesday to have fun and learn more about the group’s mission on campus. Thursday, Aug. 20 from 1-2 p.m. Cool off with free ice pops between classes on the OTC Springfield Campus plaza. We’ll only have a few more summer-like days, enjoy a cool treat while you still can! Thursday, Aug. 20 from 2 p.m. to 4 p.m.
You’ll never regret time spent blowing bubbles. Join OTC’s Academic Advisors on the plaza for an afternoon of bubbly fun. 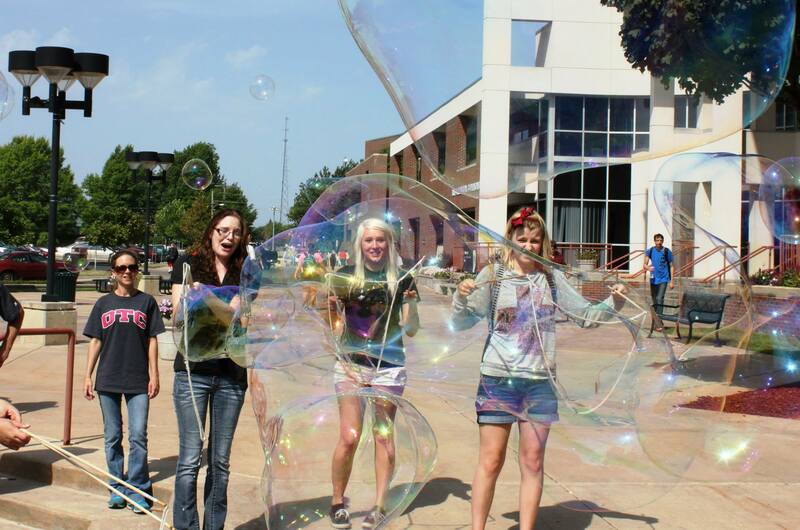 Our advisors handmade giant bubble wands and concocted their own soap to create some of the biggest bubbles you’ll ever see. 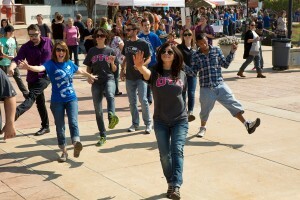 Dance Party on the Plaza! Thursday, Aug. 20 from 1-4 p.m.
DJ Nick is back with his best beats to help us kick off another semester. Grab your friends and stop by the OTC Springfield Campus plaza for our back-to-school dance party. Plus, our friends at Jimmy Johns will be there with free sub sandwiches. Need we say more?